A suicidal, depressed librarian. An abusive curmudgeon in a wheelchair. A chimpanzee in a sailor suit. YOU WON'T BELIEVE WHAT HAPPENS NEXT! Ugh, stupid Final Girl...clickbait goes in the headline, not in the post itself. This will never go viral now! Meet Louise (Carrie Snodgress), our suicidal, depressed librarian. She spends her days kind of hating her job–the books...they look at her sometimes and so she tries to burn the place down. She spends her nights crying over the man who left her at the altar years before and taking care of her father, Wendel (Ray Milland), our abusive curmudgeon in a wheelchair. Louise's life is a big, drab, sad mess, but that doesn't mean it's without some bright spots: alcohol, one night stands, and her coworker Emily. The women strike up a friendship that's equal parts support and pity; Emily feels sorry for Louise and tries to nudge her out of her drudgery, while Louise tries to save Emily from falling into the same. Louise buys Emily a one-way ticket to California so she can escape her domineering mother and marry her love, Emily buys Louise a chimpanzee. You know. Friendship! Wendel loathes pretty much everything, but he loathes his daughter and her chimp most of all. Horror fans know this is all gonna come to a head at some point, right? Like, maybe Dickie the Chimp will attack Wendel and then, having acquired a taste for human flesh, he will totally flip out and eat everyone in Wichita, Kansas? Look, I'm not going to spoil the end of this movie, even though it's like 70 years old, but I will let you know that Dickie the Chimp does not flip out, so don't get your hopes up. But don't worry! The ending still packs a serious wallop. A seriously depressing wallop. We've all seen some depressing endings before (even during this never-ending VHS Week! ), but lawd-a-mighty, The Attic might just take the cake. And then it throws the cake into the void of existential despair, and then you jump in after it not because you can't bear to see a cake go to waste (even though that's true), but because everything is terrible and life is cruel and what does everything even matter. Don't get me wrong–the entire GD movie is depressing! Loneliness, alienation, lives spent lost and adrift...this is by no means a light watch, even if the film's incongruous musical cues and bizarre jokes sometimes give it the feel of one. A better life for Louise seems to be just out of reach, and you desperately hope she'll get there, but this is a horror film, not a life-affirming yogurt love journey movie. 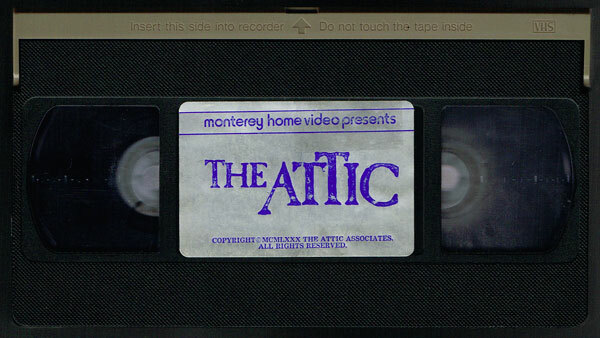 From time to time, though, you might find yourself wondering if The Attic is a horror movie. It's not so much a "slow burn" as it is a "slow drama/character piece with some horror elements crammed into the last seven minutes." Those seven minutes are worth it, mind, I just want you to know what you're in store for if you're fixin' to check this one out. Then again, The Attic boasts a scene where a showercap-wearing Ray Milland sits in a bathtub with a Reader's Digest propped in front of him and a bowl of spiced gum drops at his side. That's what really makes it worth it as far as I'm concerned. Look, I'm not going to spoil the end of this movie, even though it's like 70 years old, but I will let you know that Dickie the Chimp does not flip out, so don't get your hopes up. But don't worry! The ending still packs a serious wallop. A seriously depressing wallop. We've all seen some depressing endings before (even during this never-ending VHS Week! ), but lawd-a-mighty, The Attic might just take the cake. And then it throws the cake into the void of existential despair, and then you jump in after it not only because you can't bear to see a cake go to waste, but also because everything is terrible and life is cruel and what does anything even matter. Don't get me wrong–it's not just the ending. The entire GD movie is depressing! Loneliness, alienation, lives spent lost and adrift...this is by no means a light watch, even if the film's incongruous musical cues and bizarre jokes sometimes give it the feel of one. A better life for Louise seems to be just out of reach, and you desperately hope she'll get there, but this is a horror film, not a life-affirming yogurt love journey movie. 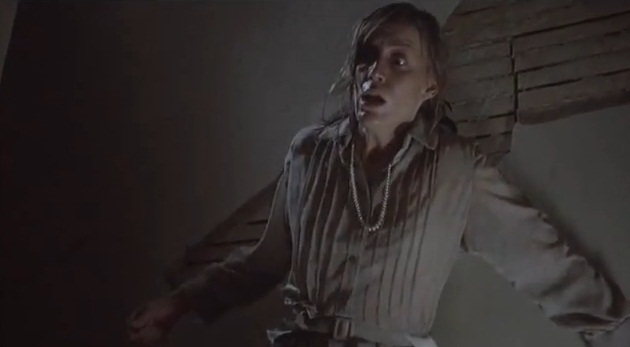 From time to time, though, you might find yourself wondering if The Attic really is a horror movie. It's not so much a "slow burn" as it is a "slow drama/character piece with some horror elements crammed into the last seven minutes." Those seven minutes are worth it, mind, I just want you to know what you're in store for if you're fixin' to check this one out. Then again, The Attic boasts a scene where a showercap-wearing Ray Milland sits in a bathtub with a Reader's Digest propped in front of him and a bowl of spiced gum drops at his side. That's what really makes watching it worth your time as far as I'm concerned.